For your peace of mind, get alerts in real-time to your email or phone. When available balance falls below a custom number. When ledger balance falls below a custom number. Daily End of the Day summary of all transactions. All check, card, and transfer transactions as they occur. When your card(s) is declined. When cash withdrawals are made using your card(s). When a card transaction exceeds a custom number. When a card-not-present transaction occurs. When an out-of-state transaction occurs. When an out-of-country transaction occurs. When someone logs into your account between custom times. If your Web Banking login is disabled. If there are changes to your address, phone number, or email address. If you receive a Secure Web Message. This process will work on a desktop, computer, tablet, mobile, or through the mobile app. 1. 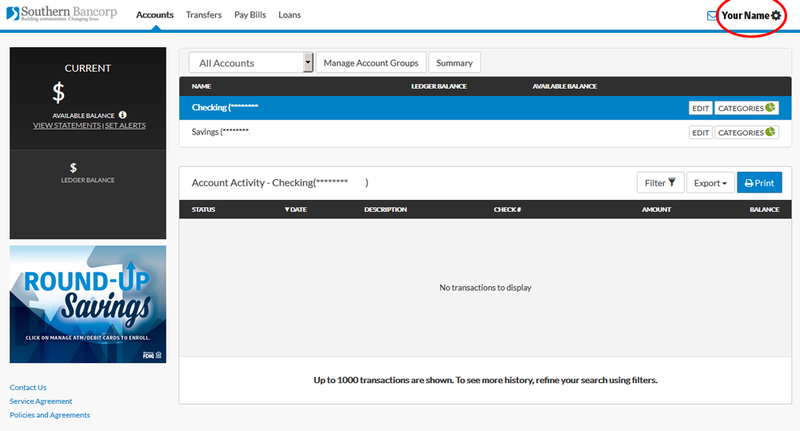 Once you have logged in to Online Banking, click on your name or the gear in the top right corner. On mobile, the three horizontal lines in the top right corner will pull out a sidebar menu when clicked. 2. Select the menu item Edit Profile. Before you set up your notification settings, please confirm the profile information is correct. The text alerts and email alerts will be going to number and email listed. Sometimes a cell phone number is put down as a home number. If the mobile phone field is NOT filled, texts will not be sent to ANY phone number. In the picture example, since (501) 555-5555 is listed as a home number, and there is nothing in the Mobile Phone field, the customer will never get an alert. 3. Check your Email Address, and the Mobile Phone field. If you made any changes, click Save. 4. 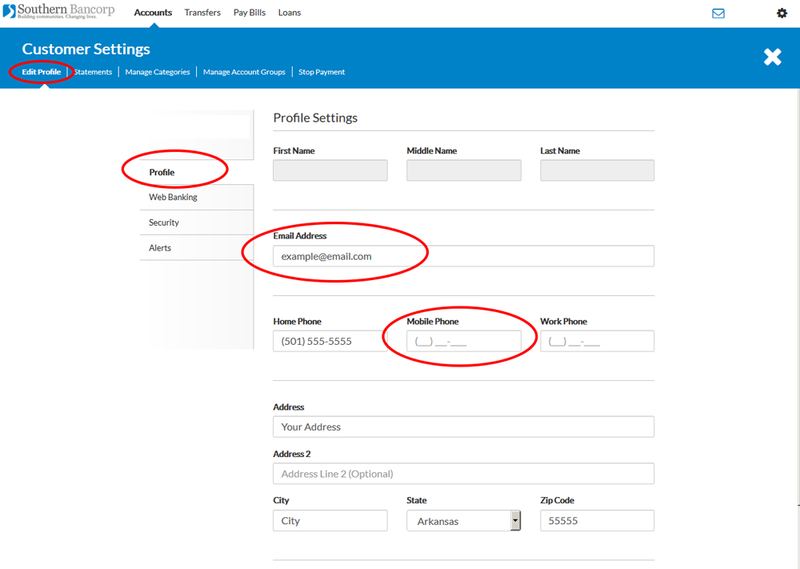 Now that you have confirmed your email address and phone number on file, go to the Alerts settings by clicking on Alerts under the main menu item Edit Profile. 5. Select the alerts you’d like to activate and Save. There are two sections for text and email alerts. The first section is Account Alerts. 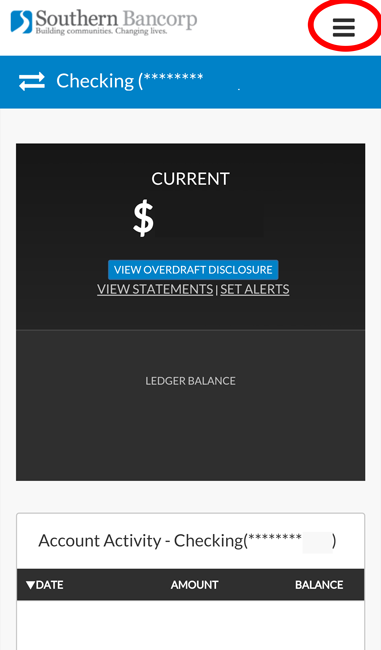 You can choose to turn on alerts for any or all of your accounts. 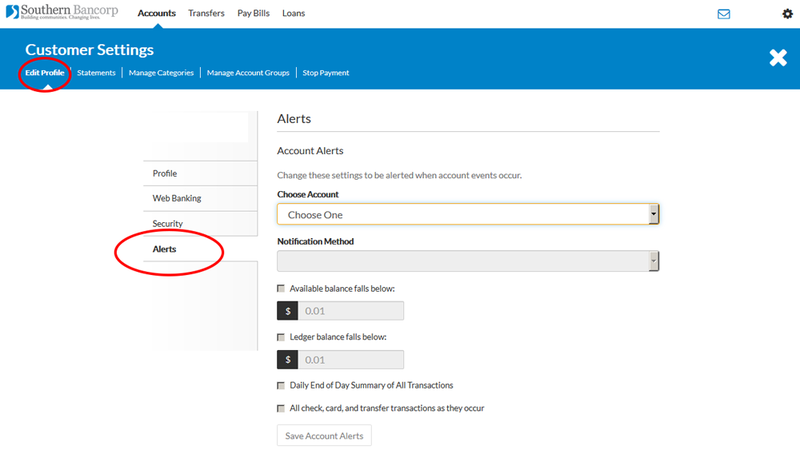 In order to activate alerts for more than one account, you will need to choose each account separately, select the correct notifications, save, and repeat until all the accounts you’d like to know about are covered. Alerts can be set to notify you by email OR text message. The second section is called Card and Security Alerts. These alerts affect all of your debit cards, regardless of account type, and your online banking.